That’s a mouth full. I’ll have to come up with a better name. If you hang around on Flickr, I’ve been inundating you with photos of this wool forever. If not, then it’s news. It has been in the works since Rhinebeck (NYS Sheep & Wool Festival) last year, when I bought some dyed rovings from Fantom Farm (no website). At the time I was inspired by a woman’s sweater I saw at Rhinebeck, which was cream with rainbow stripes on the yoke. I bought the rovings in rainbow colors, and a brown Rambouillet fleece for the body, then totally changed my mind about the sweater. First, the fleece, which is a gorgeous soft thing, didn’t like being carded. Neps galore. It loves being combed, so all is not lost, but I’ll leave combing a sweater’s worth of wool to a better woman. At MA Sheep & Wool last weekend, I found some gorgeous replacement wool for the body of the sweater. Yeah, I took a shortcut. After washing all that fleece, I didn’t want to repeat the experience anytime soon. It’s just so nice when the bathtub stays clean for more than 24 hours. This is so soft and squishy. It will make a fine sweater body. Then I started to change my mind about the rainbow stripes, which is bound to happen after 8 months, right? After visiting the Fantom Farm guys at Vermont Sheep and Wool, Rhinebeck, and Cummington last weekend, I have all the colors I need for the new and improved yoke, and they’re all spun, to boot! These are all 3+ oz., unknown yardage (I just washed them this morning), worsted weight two ply yarns, some mohair/wool and some all Romney. 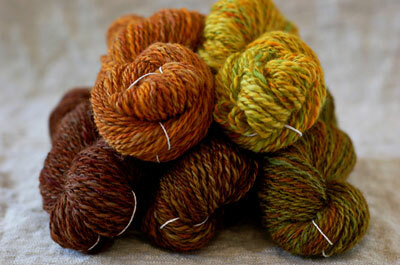 I’ll have them going from darkest at the bottom up to the acid green at the neck in a yoke with slight Bohus leanings. As much as I covet all the Bohus sweaters people are knitting, one whiff of angora and I spend the rest of the day blowing my nose, so this will have to do. The plan is not to do a full-on Bohus, but just borrow how the colors overlap a little in stripes, with those lovely little peaks and valleys, working those purl stitches in to soften the transition. It’s so brilliant a method. Surely lots will be lost without the use of the angora, but the yarns do have a bit of a halo of wooliness, so hopefully this will work out well. I’ll be back tomorrow with yet another new project that’s well underway. Ohhhh…so pretty! Can’t wait to see that in the making. it’s going to look fantastic! I love those colors together. will there be enough of a contrast between the darkest yoke color and the main body color? That is going to be one gorgeous sweater! Love the little red rainbow! I am SO impressed with your plan for this project! 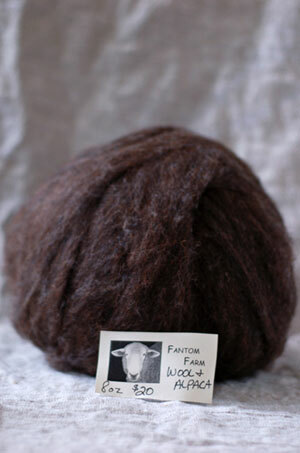 Fantom Farm was the one vendor I absolutely had to make sure to see at Cummington. (Wish they sold online…) But it never occurred to me to make a whole sweater out of their fiber! Anyway, you have Homespun Handknit, right? There’s a Bohus-style hat in there that’s just gorgeous. (And no angora in sight, just wool.) It’s worth looking at if you aren’t set on your stitch pattern yet. that is going to be one fabulous sweater. i LOVE the colors and all together (with your talent) i can’t imagine them looking anything but lovely. look forward to seeing it progress! Can’t wait to see it – it’s going to be beautiful! Wonderful colors and wool/alpaca? Mmmmm…. That’s going to be amazing! Love, love, love those colors. That will be wonderful – earthy, autumnal tones. Ooh, the yarn is lovely and the sweater will be, too. Just keep a dental floss container with you for yarn cutting. The screeners shouldn’t fault you for good oral hygiene. Have a great trip. Oooh, what beautiful colors! I can’t wait to see how it turns out – I think this is the first time I’m as excited about seeing the progress of someone else’s project as I would be if it were my own! I’ve had good luck getting through security with cat claw clippers, of all things. I’ve been bringing them on flights and into courthouses for years with no problem. I haven’t had a chance to try international flights yet though, but it’s worth a try. As for the sweater, those colors are just gorgeous! I can’t wait to see how they all work together. I wish Fantom Farm had a website. I live too far away to go to all of their festivals. That’s lovely yarn and roving! I’m looking forward to seeing how it turns out. Have a fun trip! “then a quick chart” – That is so funny to me, because although I am brave enough to chart my own designs, it takes me f o r e v e r.
I love the acid green with the orange and the browns. I’m drooling. Gorgeous yarn and colors. I can’t even imagine all that fantabulousness. *Ahem*, THAT is your airplane knitting?! You are one amazing knitter. Those are lovely colors. Forgive my stupidity, but how does one knit a Bohus sweater from the top down? it’s just jewelry to most folks. Actually that yarn cutting tool is verboten (because of the blade inside.) Nail clippers seem to do the trick- and I’ve had good luck with the little fold up scissors not getting taken. My friend just came back from Paris- they did not allow knitting needles in the cabin on the flight originating from Paris. Check with the airline when you get to Ireland to make sure. Those yoke yarns are absolutely stunning! Especially the lower-right green one, yum. How about one of those necklaces that are yarn cutters at the craft shop? Can’t wait to see your sweater. I love the chosen colors. Gorgeous wook and yarn, can’t wait to see the sweater. With about a 9 hour flight you should get a lot done. Dude!!! I can’t wait to see this and how you’ve shaped it. I’ve wanting to do one of these and your color choices RULE. I’ve just found out. thank you for your reference!